A prefabricated booster pump system for smaller municipalities in an insulated traffic box style enclosure. This enclosure is accessible from both the front and back sides as shown. In a perfectly flat world, a community’s potable water pressure would be maintained with a water tower using little more than the force of gravity. However, we all know the world is round, and when water needs to make its way across – or, more accurately, up – more rugged landscapes, delivery becomes complicated. To help overcome this challenge and ensure adequate water delivery across difficult terrain to more rural areas, booster pumps are used; however, these pumps tend to come with their own set of challenges. Though standard booster pumps have typically met the basic expectations associated with water delivery, they often leave a lot to be desired, especially when considering packaging and protection from the elements. 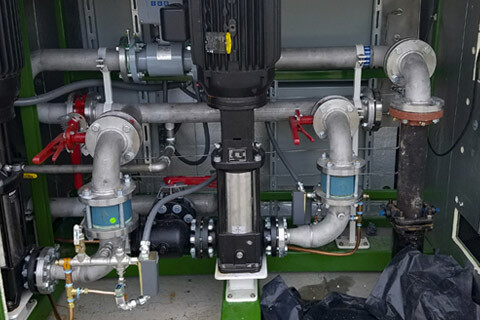 Further, from the perspective of the water operators who are tasked with servicing these pumps and related components, standard booster pumps are far from perfect. In typical waterworks applications a booster pump package is enclosed in a fairly small fiberglass tilt-up enclosure (a clamshell case). From the standpoint of surface area, these packages are great because they maintain a small footprint, but that footprint comes at a cost the operators must pay. Fitting all necessary components into such a small space with a single access point complicates maintenance. Because access is limited, simple tasks are often made difficult and when working in the field – and in the elements – that is a problem. Then again, working in the elements can be a problem for these enclosures, too. Despite the appeal of fiberglass, these shells often do not hold up well over time when exposed to cold temperatures, blazing sun, and whatever else nature may bring. As the material begins to become brittle, the critical components it contains are at risk. Further, by their very construction and size, these cases do not allow for additional equipment that can help the overall longevity of the product, such as internal climate controls. With these limitations, it is easy to ask one simple question: Why are these tightly-packed, fiberglass-bound systems in use? The answer is simple: For a long time, this booster package was the only option and the industry as a whole stuck with the classic, “If it’s not broken, don’t fix it,” approach. Though that motto works for a lot of things, it did not work for us. 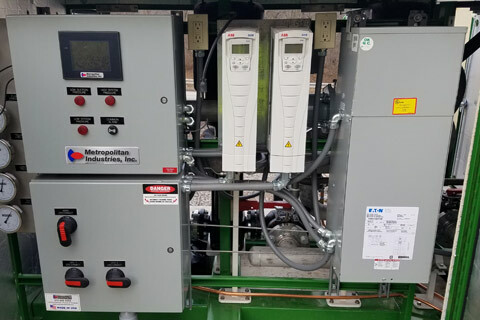 Metropolitan recognized the inefficiencies inherent to existing booster pump systems and the need to focus on both the basic functions and overall serviceability, ease of use, and the operator experience. In other words, we knew there was a better solution and we knew that this better solution would involve more than just a functioning pump. Metropolitan’s XTB Booster Pump System is designed to deliver water to hard-to-reach locations while streamlining the operator experience. With the reliability of our time-tested pumps (available as 2” with flows up to 60 gpm and 3” with flows up to 140 gpm), ensuring the flow of water was easy. To guarantee that our XTB System would be broadly compatible, we also designed our 2” version to run 7.5hp pumps on single-phase or three-phase power as the latter is not always a cost-effective option in rural areas. Finally, every XTB is built into an insulated steel enclosure that allows for better ingress protection and control of the internal environment when compared to most clamshell cases. This enables the system to maintain an ideal environment for our efficient, variable frequency drives through the inclusion of an air conditioning unit and two 1500 watt redundant heaters. But we did not stop there. For our XTB Systems to offer real value to the market, something that recognized the needs of those accessing the water and those servicing the system, we designed the XTB with the operator in mind. By designing a more accessible enclosure layout, water operators working with the XTB can easily access whatever they need without having to work through or around other components. Back to back access doors help make this possible, but we also eased troubleshooting for the life of the product. When maintenance is required, Metropolitan’s intuitive touchscreen interface eliminates keystrokes and walks the operator through every process, much like an ATM. With the manual built directly into this electronic interface – eliminating the need to lug around and keep track of a paper copy – all necessary information is at the operator’s fingertips when and where they need it most. Finally, every XTB Booster Pump System also comes standard with remote monitoring free for six months to simplify the critical pump station commissioning phase. Remote access brings all status, alarming and adjustability available through the on-unit touchscreen directly to Metropolitan and the operator’s computer or mobile device. All alarms, sent by SMS or email, can even be remotely acknowledged, letting the operator know when remote or on-site access may be required. The real measure of success for a booster pump may be its performance in the field, but at Metropolitan we know that performance often hinges on an operator’s ability to provide necessary servicing. And with the XTB, we are making the operator’s job easier than ever by providing a much needed boost.